'Tonight Show' Season Premiere Week Guests Include Donald Trump, Justin Timberlake & More — Full List! The guests have just been announced for The Tonight Show Starring Jimmy Fallon‘s season premiere week next week — and it looks like Donald Trump will be making his return to NBC! Among the guests listed, Donald will be appearing on the September 11 show to “discuss his campaign and other issues of the day,” a press release said. Other notable guests include Justin Timberlake (one of host Jimmy Fallon‘s BFFs and frequent collaborators), Ellen DeGeneres, Jessica Simpson, and many more! 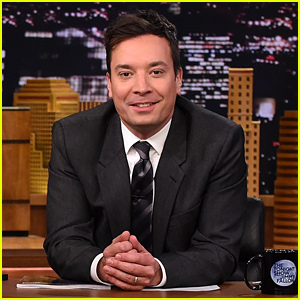 Be sure to tune in for Jimmy Fallon‘s premiere week! Chris Soules Is ‘Nasty’ And ‘Disgusting’ Says Fans: What Happened? The Bachelor Gets Broken Down: Hilariously, By Comic Bryan Safi: Watch! Amazon Is Getting A Lot More Interesting! Woody Allen Just Cast Miley Cyrus In His TV Series For The Streaming Site! Four & Tris 'Tear Down The Wall' In Brand-New 'Allegiant' Trailer – Watch!